There were numerous Lycoming County soldiers held prisoner by the Confederates during the course of the Civil War. Charles A. Rubright is one of the most notable examples. Rubright was born in Prussia on May 14, 1842. He and his family moved to America in 1845, settling in Jarrettsville, Maryland. Rubright’s father died in 1850 and his mother re-married to Daniel Dorman and in December of 1856 and they moved to Williamsport. Rubright was apprenticed to the bricklaying trade in the spring of 1857 to the bricklaying firm of Phillip Hoffman. When Lincoln called for troops in the spring of 1861, Rubright was among the first to answer Lincoln’s call. He enlisted as a private and eventually promoted to the Chief of Engineers of the 106th Pennsylvania Volunteer Infantry Regiment. He and his regiment saw action at the Battle of Gettysburg. He commanded a brigade of engineers of the Second Brigade, Second Division, Second Corps. During one engagement during this fateful battle, Rubright and his men were cornered and captured, but in a short time fought their way out. Rubright participated in all subsequent engagements of the Second Corps. Rubright’s luck ran out on June 22. 1864 when he was captured during Grant’s siege of Petersburg. He would be held in several of the Confederates’ most infamous prison camps. He was first held at Libby Prison in Richmond, Virginia. Libby Prison was a former cotton warehouse that held 1,200 men in eight crowded, vermin-infested rooms. He was also held at Belle Island, another camp near Richmond. On July 10, 1864 he was transported to the most notorious of all Confederate prison camps, Andersonville, located in Sumter County Georgia. Andersonville was a virtual hell on earth for its prisoners. At its height, Andersonville held almost 40,000 prisoners. 13,705 prisoners never made it home. Andersonville’s commandant, Henry Wirz was executed after the war for war crimes. Rubright was liberated from Andersonville on April 28, 1865. At the time of his release Rubright weighed a staggeringly small eighty-five pounds. His normal weight was twice that. He returned from the war with his constitution shattered and his health seriously hampered. Rubright was also in business for a time as a successful grocery wholesaler, running “Rubright-Hill and Company. He suffered severe financial reverses during the “Financial Panic of 1873.” He bounced back from this experience with perseverance and skill. In the words of the “Atlas,” “he stands in the front rank of the solid and honorable citizens of Williamsport.” No doubt these financial troubles paled compared to the horrors he experienced at Andersonville. One infamous Civil War prison camp was located only seventy miles from Williamsport, in Elmira, New York. The Elmira Prison Camp was opened on July 6, 1864 and the last prisoners departed from there on September 27, 1865. According to an article from the Chemung County Historical Journal by Thomas Byrne. 12,123 Confederate prisoners were held at Elmira Prison during its existence, of this, 2,963 died. Ironically, an ex-slave named John W. Jones was in charge of the burial of all of the Confederate dead. 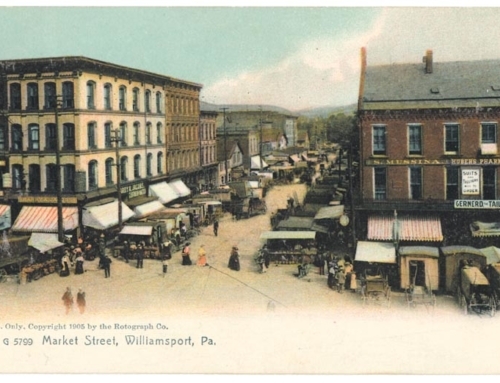 Hundreds of the prisoners held at Elmira passed through Williamsport on their way to the prison camp. On one occasion in 1864 a train carrying prisoners passed by Dickenson Seminary (now Lycoming College). There were a number of students there who came from wealthy southern families to shield them from the dangers of war. Some of these students broke out long-hidden Confederate flags and waved them from their rooms at the passing prisoners. The prisoners were heartened by this display but unfortunately, the students stirred passions on the campus and the campus of Dickenson Seminary “resembled a battlefield” as numerous fights broke out between the southern students and their pro-Union counterparts.